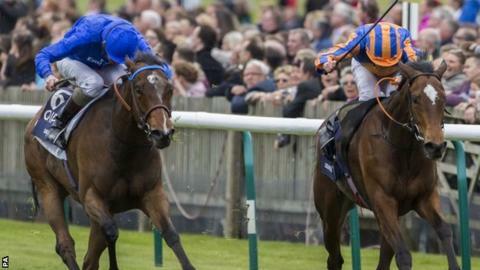 Jockey Ryan Moore made it a Newmarket Guineas double as Legatissimo won the 1,000 Guineas. Moore guided Gleneagles to victory in Saturday's 2,000 Guineas and continued his partnership with the Coolmore owners in the fillies' Classic. The 13-2 chance showed a smart turn of pace in a fast-run race to chase down fellow Irish challenger Lucida. And she stayed on well to give trainer David Wachman his first English Classic success. Moore and Legatissimo had been last at halfway and it was Lucida who went clear at the head of the field. But the winner started to lengthen and showed the benefit of her stamina, having won over an extended nine furlongs just a week ago. A very creditable win by Legatissimo, it being her third race (second success) in three weeks, and at a mile, a distance short of her optimum. The longer Epsom Oaks in June is likely to be on the agenda now. Ryan Moore has been riding for the Coolmore partners for some seasons, but now their association is more formal, completing a rare Guineas double has been a memorable way to start off the campaign. "Things happened nicely, she switched off well and we got a nice tow into the race," said Moore. "It's the first time I've sat on her, but she's obviously got plenty of ability, the second is a fair filly and she has run her down real well in the end. "They went a proper gallop - she's got plenty of speed but she really got up the hill well. I wouldn't be sure about a mile and a half, but I think she'll go further." A delighted Wachman added: "Over the winter she showed me she could be classy, but we went to Leopardstown early this season and she was beaten in soft ground and we were scratching our heads a bit. "She won very well in Gowran last week, it was like a bit of work - we were taking a chance coming here so soon, but it worked. "I knew that if it didn't come too quick we definitely had a chance."